BUNCHOSIA H. B. K., Nov. Gen. Sp. 5 [quarto]: 153. 1822 ['1821'].—Lectotype, designated by Small, 1910: B. odorata (Jacq.) DC. Malacmaea Griseb., Linnaea 13: 248. 1839.—Type: M. fluminensis Griseb. [B. maritima (Vell.) J. F. Macbr.]. Trees or shrubs; vegetative hairs medifixed, the stalk with basal spurs in 3 species; stipules borne on base of petiole; leaves usually bearing glands impressed in abaxial surface of lamina. Inflorescence mostly unbranched but ternate in a few species (rarely paniculate), axillary without vegetative leaves or terminating a lateral shoot with a single pair of vegetative leaves; pedicels pedunculate or occasionally sessile; floriferous bracts and bracteoles persistent; one or both bracteoles often bearing 1 (2) abaxial glands. Sepals leaving outermost petal exposed in enlarging bud, usually bearing 8–10 often decurrent glands, the glands rarely rudimentary; corolla bilaterally symmetrical, the posterior petal ± different from lateral petals in size, stance, and margin; petals lemon-yellow or occasionally whitish, usually glabrous, rarely very sparsely sericeous abaxially on claw and proximal midrib; lateral petals occasionally entire or only repand but mostly erose, dentate or denticulate, lacerate, or fimbriate, the divisions eglandular or glandular; androecium radially or bilaterally symmetrical; stamens with the filaments longer opposite sepals than opposite petals, proximally connate for up to 1/2 (–3/4) of their length, usually glabrous (sometimes bearing an apical tuft of hairs in B. berlinii); anthers ± alike or larger opposite sepals than opposite petals, usually glabrous (bearing apical tufts of hairs in B. anomala); pollen polyporate, without ectoapertures; gynoecium radially or bilaterally symmetrical, the carpels 2 or 3; styles as many as carpels, distinct or partially to completely connate, stout, the large usually apical stigmas subpeltate or apparently capitate (stigma elongated and decurrent on adaxial edge of style in B. anomala). Fruit indehiscent, a berry of 2 or 3 1-seeded pyrenes in a common fleshy exocarp, yellow, orange, or red at maturity, the pyrenes free from each other at maturity, with a smooth, brittle, cartilaginous wall. Chromosome number: n = 20 (W. R. Anderson, 1993a). Lombello & Forni-Martins (2002, p. 242) reported 2n = 60 for B. armeniaca; W. R. Anderson has not had the opportunity to verify the identification of their voucher. A genus of approximately 75 species, all American, from Mexico and the Caribbean to southeastern Brazil and adjacent Argentina. Habitats include relatively dry woodlands, savannas, and wet forests. [map] — Regional key to genera: Caribbean, Central America. Bunchosia is one of three arborescent genera of Malpighiaceae with fleshy, bird-dispersed fruits. Niedenzu (1928) put this genus in a subtribe with another fleshy-fruited genus, Malpighia, but W. R. Anderson (1978) pointed out that the morphology of the plants does not support such an alliance, and molecular evidence (e.g., Davis et al. 2001) has confirmed that Bunchosia, Byrsonima, and Malpighia evolved their fleshy fruits independently. Bunchosia is easily recognized by its habit, epipetiolar stipules, glands on leaves and bracteoles, lateral inflorescences of yellow flowers, large terminal stigmas, and berries with distinct pyrenes in a common fleshy exocarp. Many but not all species have the gynoecium reduced from three carpels to two, and many but not all have the styles partially to completely connate. The differences between the species are often subtle, and the taxonomy of the genus is difficult. Bunchosia is embedded in a clade dominated by woody vines, so its ancestor was probably a vine. Collectors occasionally describe plants of Bunchosia as woody vines, but I (WRA) have seen no evidence to support that description. It probably results from the fact that the branches of shrubby species may be lax; also, some collectors who do not make careful notes in the field seem to assume that all Malpighiaceae are vines. The distribution of Bunchosia in South America [map] is puzzling. There are approximately 40 species in the continent, distributed around the periphery of the Amazon valley and the Planalto of south-central Brazil. Why the genus has shunned that huge central area is difficult to understand. The fruits are readily dispersible, so the genus must have been introduced many times into central South America. There are a number of species in the wet forests of eastern Ecuador and Peru, so it is difficult to argue that Bunchosia could not have grown in the wet forests of the Amazon. On the other hand, several South American species of Bunchosia are adapted to seasonally dry open vegetation, so it is not obvious why such species have not moved farther into such habitats in Minas Gerais, Goiás, and Mato Grosso. 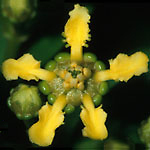 The hollowed-out distribution shown here is unique among neotropical genera of Malpighiaceae. References: There is no modern revision of the genus since Niedenzu's treatment for Das Pflanzenreich (1928). Bunchosia has been included in more recent floristic accounts, e.g., by W. R. Anderson for the Guayana Highland (1981), the Lesser Antilles (1988), Ecuador (1999), Venezuelan Guayana (2001), Nicaragua (2001), Costa Rica (2007); by J. Cuatrecasas for Colombia (1958); by J. Cuatrecasas and T. B. Croat for Panama (1981); by P. A. González G. for Cuba (2010). Etymology: The name Bunchosia is said to come from an Arabic word, bunchos, meaning coffee, for the resemblance of the seed-containing pyrenes of the fruit to the mericarps of Coffea arabica. Uses: The flesh of the fruits is edible, with the fruits of some species reaching the size of small plums. Label data with collections of such species frequently refer to the edibility of the fruits, implying that people eat them casually, but no species has ever been exploited commercially for its fruits. Species with edible fruits are called ciruela, ciruela de fraile, and ciruela de montaña in Spanish-speaking countries and marmelo in Brazil. One species, B. glandulifera (Jacq.) H. B. K., is cultivated as a decorative small tree in towns and cities throughout much of South America and in Cuba, and its large red-orange fruits are eaten (see discussion in W. R. Anderson, 2001a, p. 103). At some point B. glandulifera was introduced to the horticultural trade in the United States as "B. argentea", and it is widely sold under that name. The two species are easily distinguished. In B. argentea (Jacq.) DC. the leaves are flat, and the back side of the leaf is silvery due to very dense appressed hairs that completely hide the epidermis (the name "argentea" refers to that silvery indument). In B. glandulifera the leaves are notably wavy at the margin; on the back side of the leaf there are hairs, but they are not nearly dense enough to hide the epidermis. All the photos seen on other websites of plants that are supposed to be B. argentea are actually B. glandulifera. As far as is known, B. argentea is not and never has been cultivated.